I made strawberry date squares twice in July and both times I didn’t use all my crumbly oat mixture. 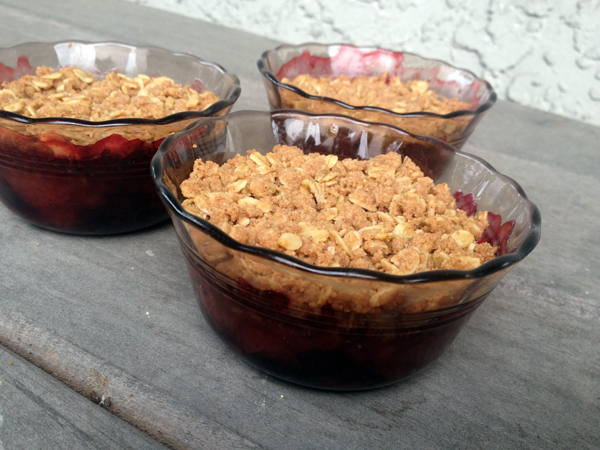 I froze the left-overs thinking I would use them to make mini fruit crumbles some day. Last week, I got two pounds of strawberries. I froze some for later use, made some into compote (for toast, crepes and Coconut Bliss) and the rest I chopped up for fruit crumble. The crumbly oat mixture from my first batch of strawberry date squares was a bit floury. So, after letting the oat mixture defrost for 30 minutes, I mixed in a wee bit of extra coconut oil and water with my fingers until the texture felt right (about 1/2 tsp coconut oil and a few drops of water… very approximate 9:1 volume ratio). Defrost left-over crumble oat mixture for 30 min – 1 hr. Defrost 1/2 cup blueberries for 30 min – 1 hr. This keeps them from sticking together when you add them to the strawberries. Chop strawberries. Put in mixing bowl. Add sugar, maple syrup, lemon juice, almond essence, cinnamon and sifted cornstarch. Add blueberries. Mix gently and thoroughly. Split fruit mixture evenly into 4 cups. Cover tops with crumbly oat mixture. Put cups in oven for 25-30 minutes. The crumbles are done when the fruit is bubbling and topping is slightly toasty looking. Let cool on cooling rack for at least 30 minutes (unless you want to burn your tongue).